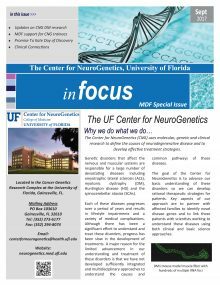 The Center for NeuroGenetics Newsletter is designed to keep in touch with the broader community of patients, families, caregivers and other researchers that have an interest in the diseases that we study and the progress that we strive to make. 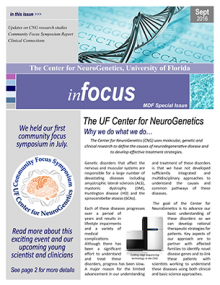 Our CNG Newsletter “InFocus” is now available by clicking on the images below. In this first edition we are introducing the Research labs and Clinical connections within the CNG so that you can get to know who we are and what we do. Would you like InFocus sent directly to you whenever a new edition is published? Fill out the form of your choice below (email or traditional mail) and we will be sure you receive the next issue when it is available. 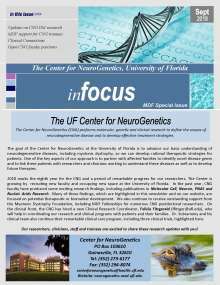 To receive the CNG's InFocus Newsletter via email submit your name and email address below. 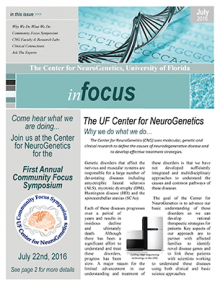 To receive the CNG's InFocus Newsletter by traditional mail enter your name and address below.